Condition: Pre-owned as made with COA and new cardboard plate box. In celebration of his milestone silver anniversary as a published artist, Thomas Kinkade has personally chosen the works that he feels best represent his enduring vision. These are his masterpieces, now brought together as never before in one exclusive collector’s plate series. The Premier Edition in the collection, “A Holiday Gathering”, presents a tranquil scene that is among Thomas Kinkade’s most beautiful images ever. Each plate in the edition is handcrafted on precious Heirloom Porcelain® to capture all the luminous detail and color of Thomas Kinkade’s original painting, completed in 1998 and an instant classic upon its release. 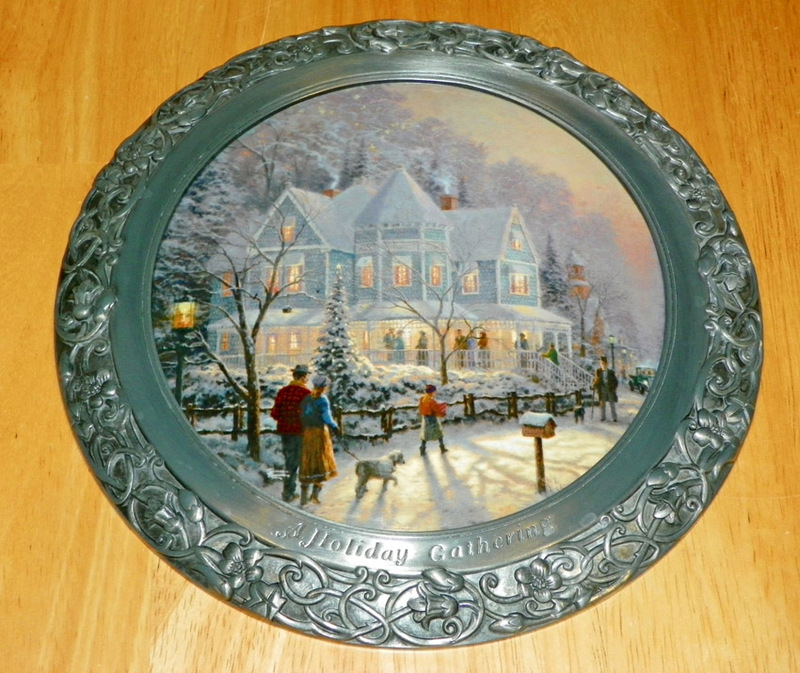 With a sleek, polished inner rim and a sculpted, trailing vine design inspired by Thomas Kinkade’s art around its outer edge, the genuine pewter frame surrounding “A Holiday Gathering” is a work of art in itself. Inscribed with the edition title on the front, this silver-toned pewter provides heirloom-quality richness to the presentation. Plate measures 8¼ inches in diameter (21 cm). Comes with attached hanging device for easy wall display.